Obituary for John "Jack" A Norman | Kostanski Funeral Home, Inc.
John A. “Jack” Norman passed away on March 21, 2019 at his home in Titusville, Florida after fighting a long battle with cancer. He is survived by his brother David in Greenfield, Massachusetts and numerous generations of cousins. Also the extended family who loved and cared for him. Jack was born in Greenfield, Massachusetts the son of George R. and Carolyn E. (Winn) Norman and raised in Deerfield. He graduated from Frontier Regional High School. 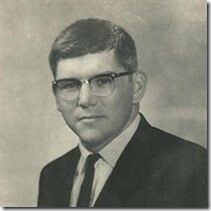 While at school he was elected in 1965 to represent Frontier at the Student Government Day in Boston. Also, elected as citizen of the month, on the basis of leadership qualities, personality and contributions to the school. Certainly characteristics Jack carried throughout his whole life. He stayed very busy after school hours working on the Gibbs Farm, working for Walter Melnik and Sons at Bar Way Farm, an active member of the Deerfield Fire Department, a provisional officer in the Coast Guard Auxiliary and commanding officer of the Sea Explorer Ship 60 Turners Falls. As if that wasn’t enough he participated in boating, water-skiing and scuba diving. Funny story – while working at the Melnik farm the cows got loose. Well, Jack was not your traditional cowboy. He drove his Cadillac one way and Walter, the owner, drove his Cadillac on the other side and that is how they rounded up the cows! Entering into the working world, Jack spent many years driving truck. Including the paving and construction company Max Antes, Mayflower Moving, Pepsi and while driving for Pepsi he managed to establish his own transport company which hauled produce up and down the east coast. His love and passion was always for the fire department. 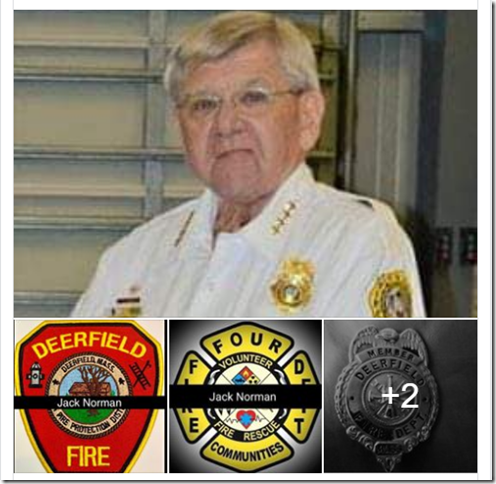 Jack was a proud Deerfield native who served on the Deerfield Fire Department for over 30-years. He continued to support the department even after moving to Florida. Recently donating a Federal Q Siren that proudly sits on Engine 1 in his honor. In 1996 he moved to Florida, good-bye to cold, snow and ice. He was often asked “Why Titusville?”. He would say “I carried an ice scraper with me and once I reached a place where they didn’t know what it was – it was time to put down stakes”. Still needing to do more in Florida, Jack went to work at the Space Center. He drove the bus and vehicles that brought dignitaries and their families, Presidents (Jimmy Carter for example), astronauts and their families (Mrs. John Glenn for example) and movie stars out to see launches. During his 15 years with the Space Center he received numerous awards for his exemplary service. Jack also started working for the Sheriff’s Department of Brevard County. The Department has a Mobile Command Center truck and trailer that he took great pride in making sure it was in tip top appearance. He drove it to sites where it was needed. Jack continued his community contributions and his passion for the fire department by leadership of the Four Communities Fire Station. He made a significant difference in the flourishing of Station 28. He continued as a life time member attending as many meetings as he could. Nothing could keep him away, he even stopped there the day before passing on to God’s department. Jack had so many interests through the years the list is lengthy. But, his heart was with the real fire trucks. He restored many to their glory. His pride and Joy was his Cumberland-Carlisle 1947 Aherns Fox. He was a member of SPAAMFAA.org, Mohawk Last Do Collectors Club, Massachusetts Fire Truck Association, Florida Bucket Brigade and probably many more. He was always out searching for more trucks and deals, you know “Looky Looing”! Let us not forget the jokes – HE NEVER DID!! He so enjoyed making people laugh and smile. Almost every day he passed them on to friends and family via the computer or to visitors. Jack was happy to be around people, so approachable, friendly and willing to interact with you. He had such an infectious personality that his web of friends is infinite. Jack found serving the community his calling. It is so evident by the number of people who will miss him from this day forward. Riding on the Deerfield Antique Fire Truck as his final earthly fire call. Burial will be at the cemetery on Upper Road, West Deerfield Massachusetts. There's still time to send flowers to the Celebration of Life at the Robbins Memorial Church at 11:00 AM on May 4, 2019.